Now that you know who your target market is on a superficial level, you can use that information to deepen your understanding of your customers as individuals, and learn what drives them. While knowing your market’s demographics give you the power to spot potential customers in a crowd, understanding your market’s behavior will enable you to attract them to your offerings. 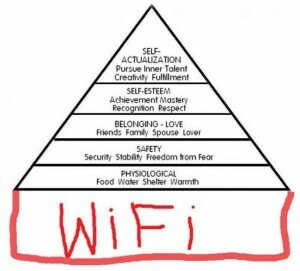 While the reality of Maslow’s theory isn’t quite as rigid as the pyramid image suggests (for example, people who are without shelter still worry about their relationships), having an overall understanding of an individual’s priorities and where your offerings fit in is the foundation of your marketing plan. The desire to fulfill a need is what drives human beings to take action; motivation is the energy of that desire. The desire to fulfill a need (whether conscious or unconsciousness) is what drives human beings to take action and make choices. Motivation is the energy of that desire. Determining how you can influence and direct that energy towards your offerings is the essential question you’ll be answering with your marketing plan. Many offerings have the potential to fulfill more than one of a customer’s needs. If you’re doing marketing for the first time as a business owner, you’ll want to do some brainstorming and write down all the needs your business could potentially fulfill. While you’ll want to be as specific as possible, you’ll also want to make sure you understand where specific needs fit into the hierarchy above. Let’s say you’re starting a yoga studio. You’ll probably be able to come up with quite a few different motives people have to come to a class. Students could be seeking a greater sense of spiritual fulfillment (tapping into a higher need for self-actualization), hope to find a place where they can connect with a community (tapping into a need for love and belonging), or be trying to tackle a problem with chronic stress which triggers illness and pain. With this understanding, you might decide you want your marketing plan to focus on promoting the stress-reducing benefits of yoga since physical well-being and freedom from pain is part of the need for safety. Appealing to such a fundamental need that would likely appeal to a broad market—you could offer your classes everywhere from your yoga studio to schools to physical rehabilitation facilities. Alternatively, you could decide to highlight a specific element of spirituality that your classes focus on. You’d market this kind of yoga studio much differently, and much more narrowly, than one focused exclusively on health and stress relief. You would likely have a smaller client base to choose from, but you might also discover that being able to offer a sense of meaning and self-actualization results in more loyal customers, who value your specific services rather than “yoga” or “exercise” more generally. In the coming weeks we’ll cover how account for customer values and attitudes in your marketing plan, how to segment your target market, and how to validate that a market is one that can be tapped into and is actually large enough to support your business. Follow @wpbusinesstips on Twitter or subscribe to our mailing list to get our new posts every Thursday. New followers (through this Friday April 3rd, 2015) will be entered to win one of five copies of Blog-a-Week by Tim Priebe!